Coming of Age Day — Congratulation 20-year-olds in Japan!! Today is Coming of Age Day (in Japanese “Seijin-no-hi”) in Japan. Every year, it’s celebrated on the second Monday of January. All young people who turn 20 years old in that year are celebrated. 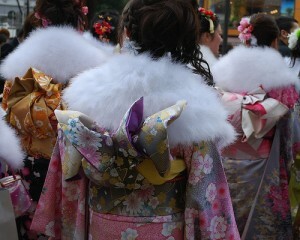 They dress up and go to ceremony which is held in each town. Most women wear colorful furisode (long sleeved kimono), and some men wear hakama (long pleated culotte-like trousers worn with kimono top) but many men wear formal western suits. At the ceremony, usually a mayor and other guests give speech, and the new adults get small gifts. After the ceremony, they usually hold a class reunion. In Japan, 20 is the age considered as the beginning of adulthood.